It's a Sunday night, and I've just finished waxing my legs, painting my nails, and watching Tangled. Yes, I'm an eighteen year old, fully moved out human being. But there is just something about Disney movies that I love. Particularly (but not limited to) Princess ones. And I know, I know Disney does not have the best reputation when it comes to racism and sexism, and before I continue this post, I completely 100% do NOT condone that. But, I love Disney films. I love the songs, I love the characters, I love the dresses and I love how they make me feel like a little girl again. I think the love of Disney for all ages comes because now, it's been around for a good old while. Even if our parents and grandparents were older when they watched the films we saw as children, it brings back different kinds of memories. For me, I remember watching Beauty and the Beast as a tiny child, and being in awe of Belle and terrified of the Beast. But for my parents, Beauty and the Beast reminds them of their first ever cinema date. There are a lot of arguments for how Disney creates an unrealistic image for girls to look up to. And whilst I agree the world is moving on, and women should not always be portrayed as perfect, hour glass figured girls with dainty feet and long eye lashes. At the same time, I find it hard to see why Disney films are classed as 'bad' when the Chick Flicks I know and love, don't exactly use actresses who look like the back of a bus. 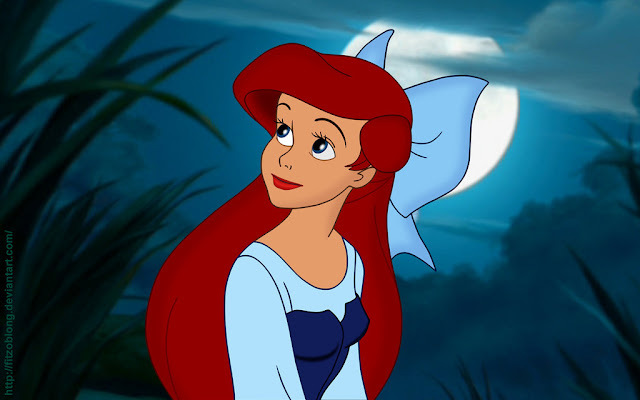 When I was little, I never used to look at Ariel and think, 'Ugh, she's so skinny, I wish I was her' or 'Oh my god look at Aurora's long blonde hair, why is mine so short and dark'... To me, as soon as I put on a 'princess dress' I was Aurora. And I didn't want to be Ariel because of what she looked like, I quite simply just wanted to be a mermaid (...and now I'd quite like a Prince Eric). But my love of Disney films isn't limited to the ones of true love and princesses in floaty dresses. I love Lady and the Tramp, I love Tarzan, I love Toy Story and I love love love Lilo and Stitch. In fact, it's my favorite Disney film of all time. Or at least on a joint first with The Little Mermaid. I think I secretly just wanted to express my love for Disney, as I feel like I'm rambling and not actually making a point. But I really like Disney films, and when I'm older I swear to God, I will introduce my children to everything from the Jungle Book to Frozen. They make you feel good, they have catchy songs, and some of my earliest memories are laughing hysterically as my dad pretended to be Roger from 101 Dalmations, singing Cruella De Vil or when me and my sister would jump from sofa to sofa, pretending to be Wendy from Peter Pan. A little while ago I read something that gave me a warm fuzzy feeling. If you're of a similar age to me, you will probably appreciate this too, and I thought it was just too good not to share. The creators of Toy Story and Monsters Inc, waited over 10 years for the sequels to come out (Toy Story 3 and Monsters University)... The children who watched the originals are now 17/18/19, at the exact age where we all say goodbye to our childhoods and move on, most of us to 'college.' Just like Andy. These films have quite literally followed us through our childhoods. Now, I know this is really just a brilliant scheme for Disney/Pixar to make more money from girls and boys like me who want to relive their childhood forever. But I have to admit it worked. Because I went to see both films at the cinema at least twice. And I related to them both. Exactly as Disney intended. Anyway, as I said I've completely lost the point in this post and I'm just rambling on about my love for Disney, but everything I've written is completely heartfelt. However old I get, I doubt I will ever see a rabbit hole without thinking of Alice in Wonderland, or buy a china set without thinking of Mrs Potts. And I will never, stop wanting to be Ariel. I'm so glad you agree! Lady and the Tramp is my mums favourite, and a Frozen party sounds amazing!! Loved the post so much! It's like you've just written everything that I feel about Disney, so many memories. We'll never be too old for Disney :) I've planned to show all the movies to my kids one day too :') And as you said, I'll never stop wanting to be Ariel either and see things that remind me of Disney movies. After my GCSE's in my study leave I spent HOURS watching pretty much every single Disney film!! Hahahah don't worry I can't judge you! Hi Alice, this post just made me so happy and nostalgic! As a Disney fan myself, I can say that all the films just have this magical quality that makes me forget about the real world for about an hour and a half :) I'm going to try and rewatch all my old favorites this summer! I love disney films so much, they make me so happy! My dream is to work in Disneyland Florida in my gap year, how fabulous would that be! I'm 21 and I still love Disney as much as when I was a little child. I actually just bought more Disney DVDs today (yay for BOGOF). I love the nostalgia it provides me, and even the saddest of Disney films help to make me feel better when I'm down! I also will never stop wanting to be Ariel and I have been obsessively singing the Frozen soundtrack for the past week! I LOVE Disney films! no matter how old I get, I will always love them! Why should we stop watching disney movies growing up? I've always loved these movies, I think the one I love most is Peter Pan (than comes Aladdin, Kuzco, The aristocats). I will certainly never grow tired of watching it. we're pretty sure we had the little mermaid, beauty and the beast and Alice and wonderland on replay on our old VHS (remember those!!). Did you ever watch Anastasia? We loved that too, but we're not sure it's as popular as other Disney movies.